What is it about twin girls born day after Obama? Today, Barack Obama blinked – releasing birth records he has hired lawyers to prevent the public from seeing, even at the expense of allowing U.S. Army Lt. Col. Terrence Lakin to be court-martialed and sent to prison for having dared ask questions the White House until now has resolutely dismissed with ridicule and disdain. A key problem for Obama is that birth certificates issued to twin girls born one day later at Kapi’olani hospital, the Nordykes, are the Rosetta Stone of deciphering both Obama’s previously released short-form Certification of Live Birth and the newly released purported copy of his long-form birth certificate. Be the first to get an autographed copy of Jerome Corsi’s upcoming blockbuster, “Where’s the Birth Certificate?” and help get TV commercials on the air! As WND reported, the long-form birth certificates issued by Kapi’olani to the Nordyke twins have certificate numbers lower than the number given Obama, even though the president purportedly was born at the same hospital a day earlier than the Nordykes. Note, Susan Nordyke, the first twin, was born at 2:12 p.m. Hawaii time Aug. 5, 1961, and was given certificate No. 151 – 61 – 10637, which was filed with the Hawaii registrar Aug. 11, 1961. Gretchen Nordyke, the second twin, was born at 2:17 p.m. Hawaii time Aug. 5, 1961, and was given certificate No. 151 – 61 – 10638, which was also filed with the Hawaii registrar Aug. 11, 1961. Yet, according to the Certification of Live Birth displayed by FactCheck.org during the 2008 presidential campaign – and now according to the long-form birth certificate the White House released today – Barack Obama was given a higher certificate number than the Nordykes. Note, Obama was given certificate No. 151 – 1961 – 10641, even though he was born Aug. 4, 1961, the day before the Nordyke twins, and his birth was registered with the Hawaii Department of Health registrar three days earlier, Aug. 8, 1961. In 1961, the birth certificate numbers were not assigned by the hospitals. Instead, the numbers were stamped to the birth record by the Hawaii Department of Health at the main office in Honolulu. This is the only place birth certificate numbers were assigned. At the last step of the process, the documents were accepted by the registrar general, with the date of registration inserted in box No. 22 on the lower right hand corner of the long-form birth certificate. The date the birth document was accepted by the registrar general was the date the birth certificate number was stamped on the birth record. 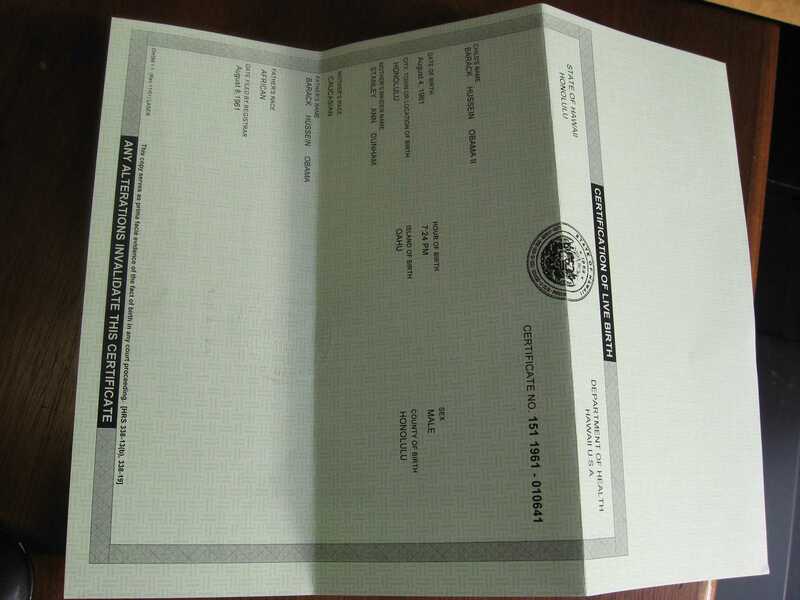 The birth certificate number was stamped on the form by a rubber stamp that automatically increased by one each time a birth certificate was stamped. The question, therefore, is how was it possible that the Nordyke twins had their birth certificates accepted by the registrar general in Hawaii three days later than the registrar general accepted Obama’s birth certificate, when the twins’ numbers are lower than Obama’s number? Eleanor Nordyke has speculated that her twins received an earlier birth certificate number because, although she gave birth later than Ann Dunham, she entered Kapi’olani earlier. Yet, in 1961, birth certificate numbers were not assigned by the hospital, and the date the mother checked into the medical facility was irrelevant to how birth certificate numbers were assigned. Moreover, no records for Dunham having been a patient at Kapi’olani in 1961, or of Obama having been born at the hospital on Aug. 4, 1961, have been released by the hospital. Now that President Obama has personally vouched for the authenticity of the birth certificate the White House released today, he can reasonably be asked to authorize Kapi’olani Medical Center to release any and all medical records the hospital may hold for his mother and Barack Obama Sr., his listed father. The debate over Obama’s eligibility to be president has truly only just begun, with Obama’s status having changed overnight from a bemused observer to a full-contact participant. Two weeks before the publication of my book “Where’s the Birth Certificate?” the effort to document Obama’s past has begun in earnest. Fundamentally, the world changed for Barack Obama this morning, not just in increasing pressure for the release of the many hidden documents about his past, but in the inescapable reality that the White House must defend this newly released birth certificate as authentic. Before today, Obama may have attempted to explain away problems with the short-form Certification of Live Birth as the work of his supporters. Before today, the president largely remained above the fray. Now, he has fully engaged in the presentation and defense of his birth records and his status as a “natural born citizen” under Article 2, Section 1 of the Constitution. Obama’s presidency now depends upon the White House being able to support the veracity of all the information contained in the birth document released yesterday morning. In the final analysis, proof that the document is an authentic Obama birth record will await forensic examination.